I have always loved radishes. They're ruby red, crunchy, and a tad spicy, making them a perfect addition to any vegetable platter or salad. 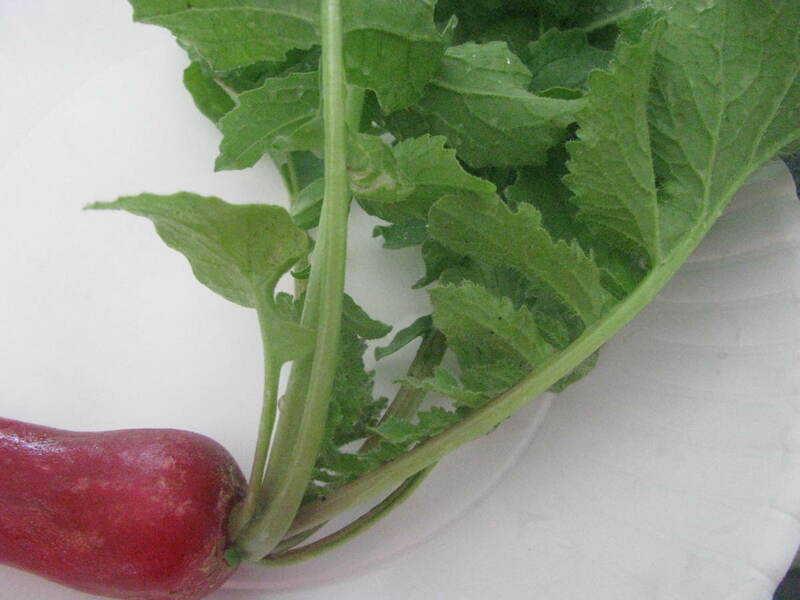 Here you are going to find two of my radish recipes, along with their health benefits. Enjoy! 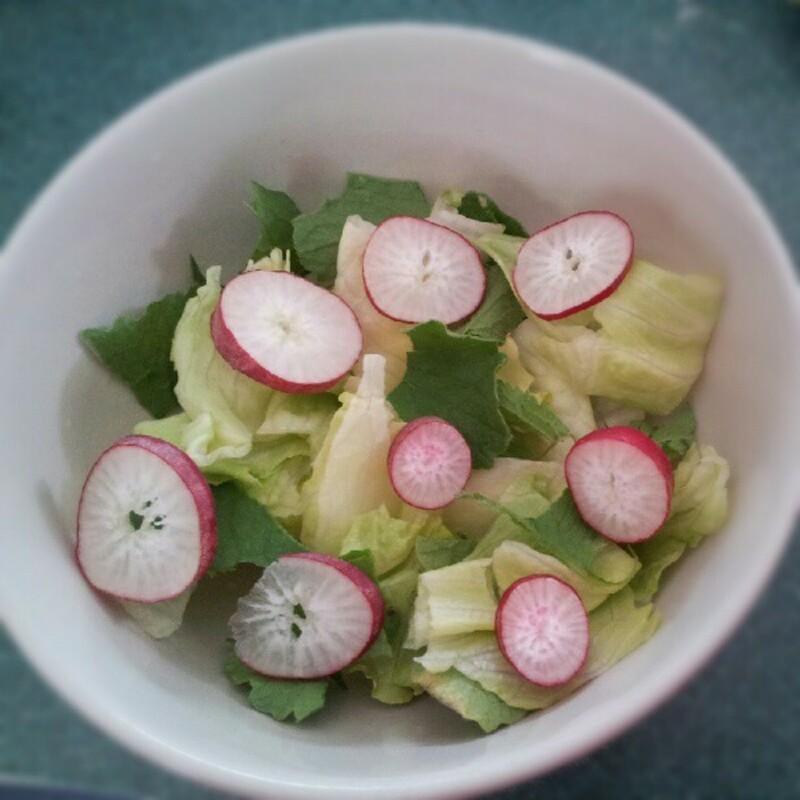 When I harvested my first small crop of radishes from my summer garden, I noticed how beautiful their leaves and tops were, making me wonder: are radish greens edible? Yes, they are! Also, they are superbly healthy for you! They contain almost six times the Vitamin C content as the vegetable part, as well as healthy doses of calcium and protein. So, how do they taste? Well, to be honest, they are quite bitter and rough in the raw. 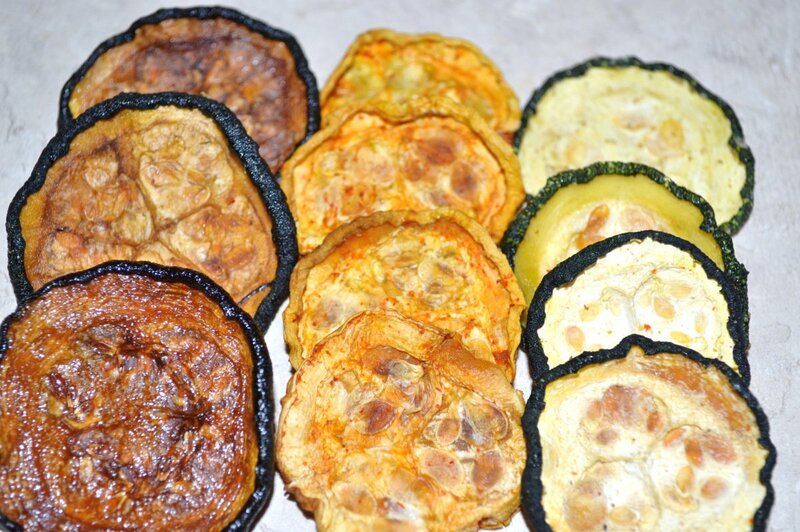 However, when added to a salad or sauteed, they are fantastic. Below you will find two recipes using the greens. The ones I used came from my garden, but you can find them in stores as well. Enjoy! I used peach mango preserves for this recipe, but you could probably use any other kind of similar preserves or substitute in some honey for the sweetness. 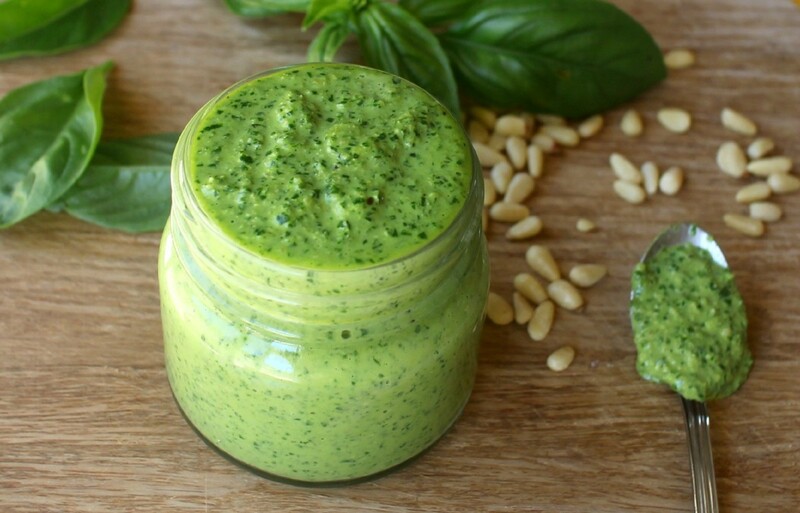 The amounts for this dressing will make enough for one large salad. You can add more to the mix and store it in the fridge or make less for a small salad. Make sure to mix well before serving! 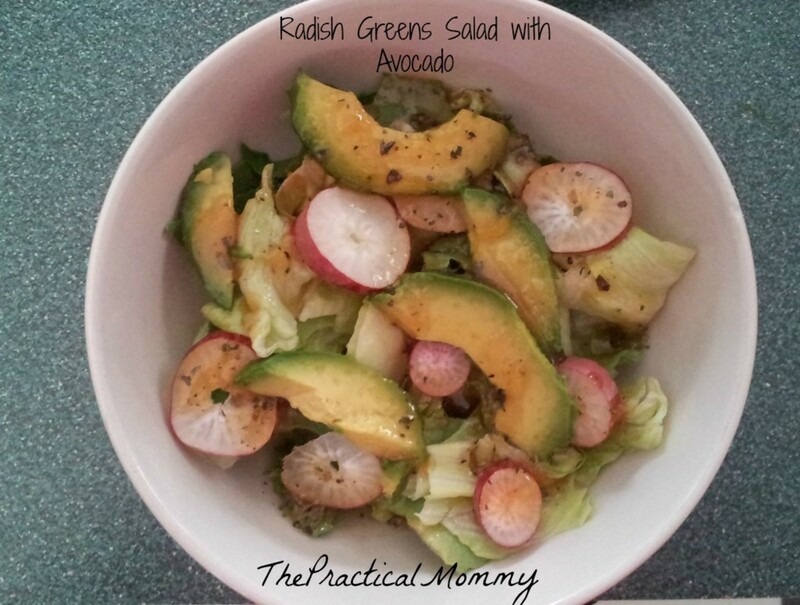 Radish greens salad with avocado and a peach mango dressing. Thoroughly clean lettuce, radishes, and greens in cool water. Pat dry with a paper towel. Tear apart lettuce and greens and place in a large salad bowl. Thinly slice radishes and mix into lettuce and greens. 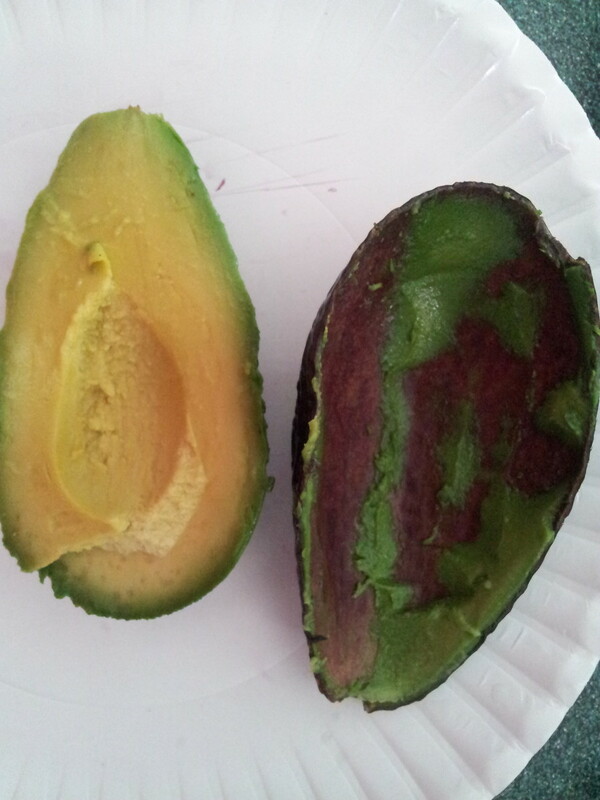 Slice an avocado, and put one half to the side. If necessary, remove the seed. Gently spoon the avocado from the shell, and slice. Place it on top of the salad. 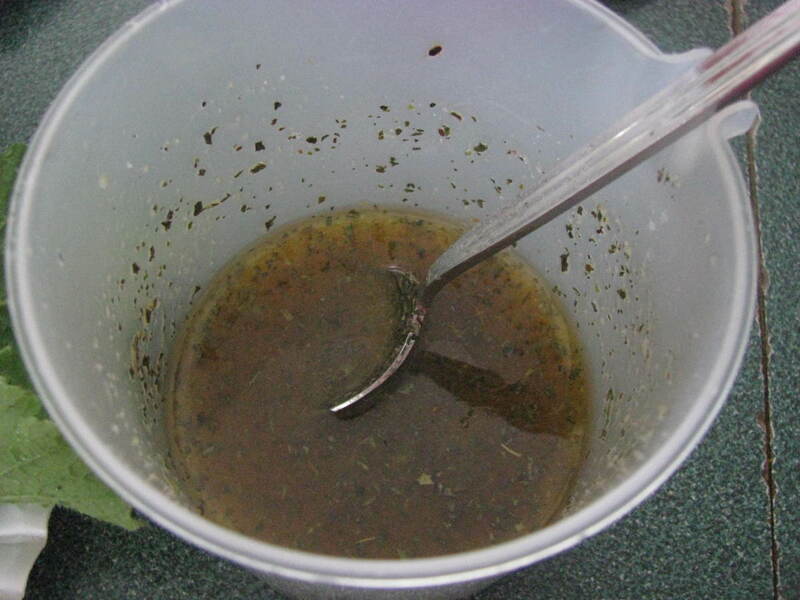 In a separate bowl (I used a measuring cup), prepare the dressing. Mix ingredients until no longer chunky from preserves. Pour over salad. Optional: For additional crunch, you can add croutons, sunflower seeds, walnuts, or sliced almonds. Below is the nutritional value of the radish greens salad, not including the dressing or the avocado. 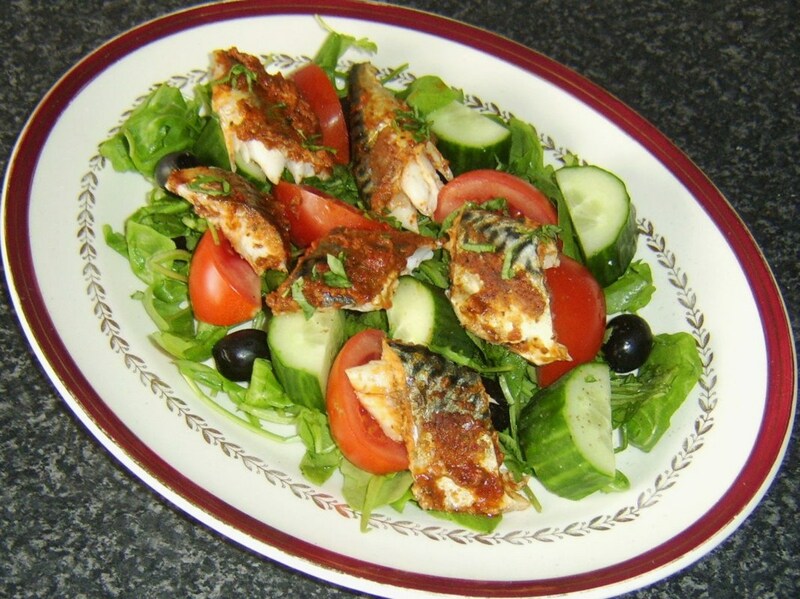 As you can see, for very few calories you can fill up since the salad is mostly roughage. 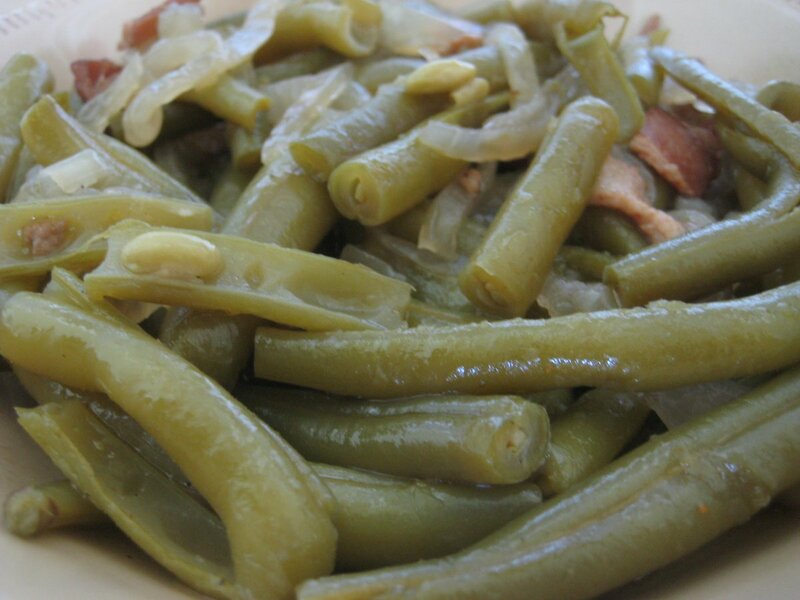 If you would rather cook the radish greens, here is a nice side dish recipe. 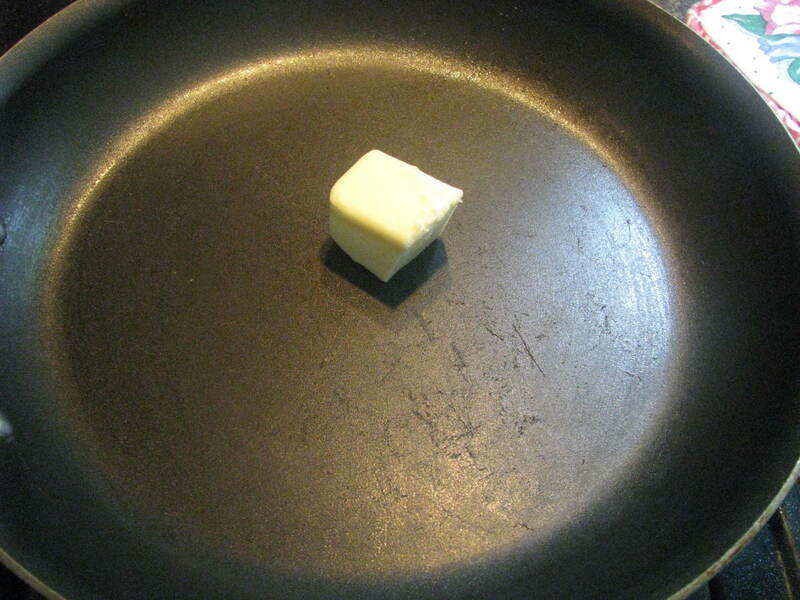 In a pan, melt butter. Add minced garlic, red pepper flakes, olive oil, onion powder, and sunflower seeds. 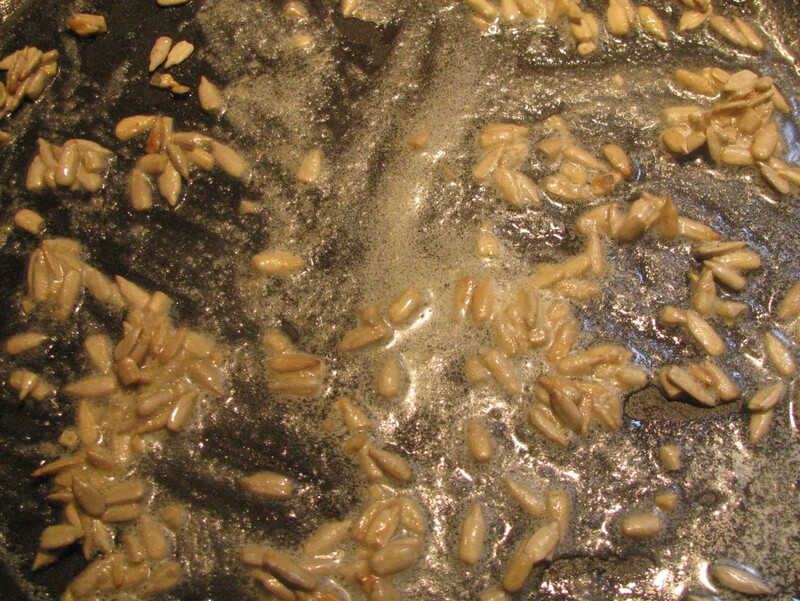 Stir until sunflower seeds are slightly browned. Add in radish greens. Sauté until tender. Add salt to taste. Have you ever tried radish greens? George, I've never cooked turnip greens so I honestly don't know! Can you cook radish greens like you would turnip greens? Never have eaten them before but was wondering. Thank you so much for these Radish / Radish Green recipes. I was looking for recipes like these last Summer (when we grew our own) but then I forgot about it. We LOVE radishes - and always buy only the biggest, freshest and leafiest bunchs (so beautiful - even as a centerpiece) but then the beautiful greens go to waste and so do some of the radishes. 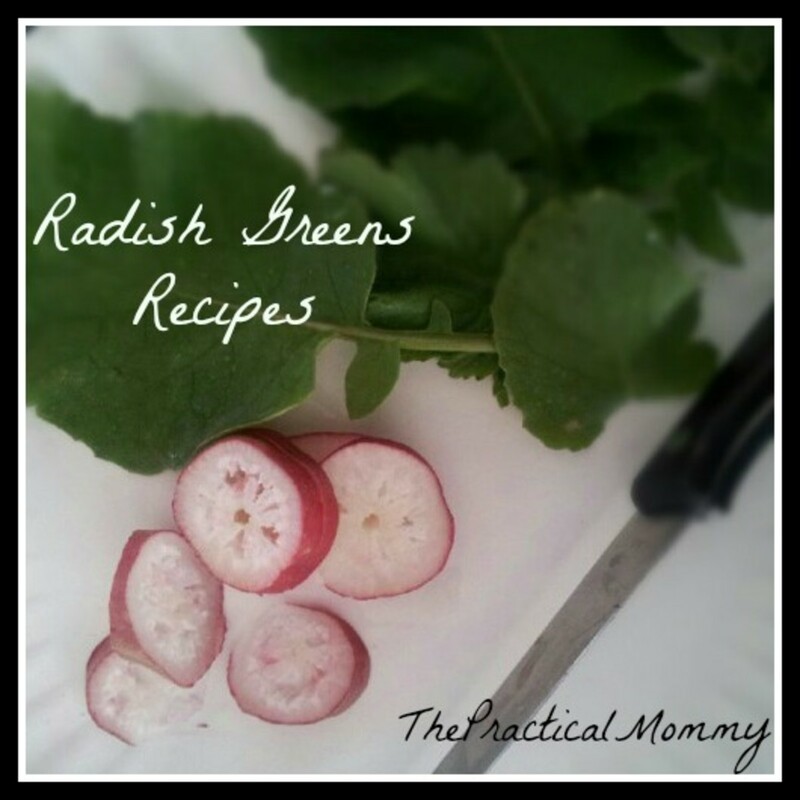 I've been wanting to try cooked radishes (and especially radish greens - I love greens and I think they are the best part of a beet - so why not with radishes too??? Besides, waste not want not. Your recipes sound very promising and I will definitely be trying them the next time I get to a fresh produce market (probably tomorrow) - the ones at the supermarket tend to look pretty tired and limp. Thanks! This looks really good. I've never had radish greens before but they seem very healthy for you! I DIDN'T KNOW ANYONE ELSE ATE THE RADISH GREENS. WHEN I WAS GROWING UP WE HAD ALL KINDS OF GREENS WE ATE, INCLUDING DANDELION GREENS! What interesting recipes. I have never had the greens but now that I think about it, most stores sell them without the greens. Thank you for sharing...I am growing some this year for sure. I also like to roast the radishes in a pan with a bit of EVOO or butter. Yum. These recipes sound wonderful. I've been noticing great radishes with perfect leaves at whole foods lately. I tend to use radishes in the summer and at the holidays, these salads make me want them all year round. Now that I know the health benefits, I want to make sure to have them all year. Rosie, you'll love it! Thanks for reading! I've been eyeing bunches of organic radishes! I'd love to have a salad with them and the Sweet Peach Mango Preserves Dressing! Inez, I bet that tastes great! Thanks for the tip! 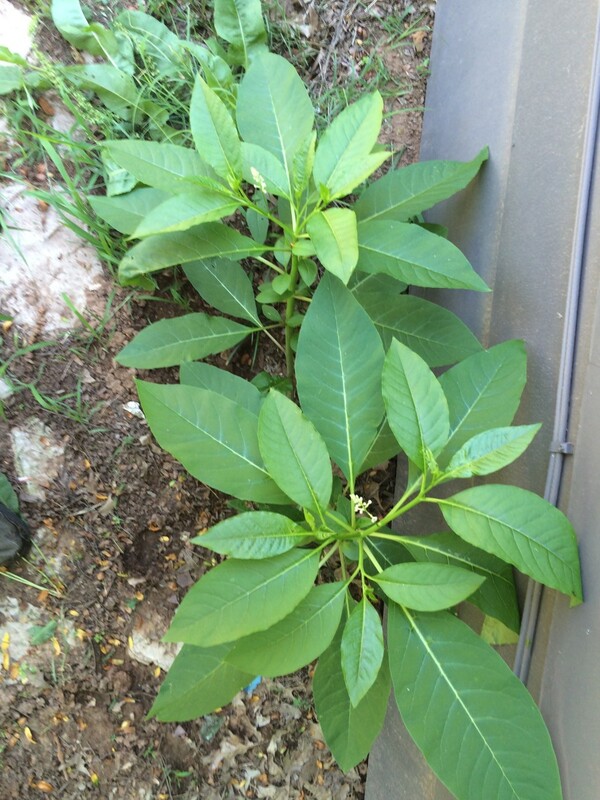 peachpurple, no, the radish can be mild to spicy, depending on how long it is in the ground. The radishes are great for our bodies; great point! Thanks for reading! Alise- Evon , I never thought to put the radish greens in a smoothie. Good thinking! I tried radish greens last summer- I couldn't eat them raw because they were too scratchy for me, but I did like the taste. We ended up throwing them in our smoothies, which worked great. 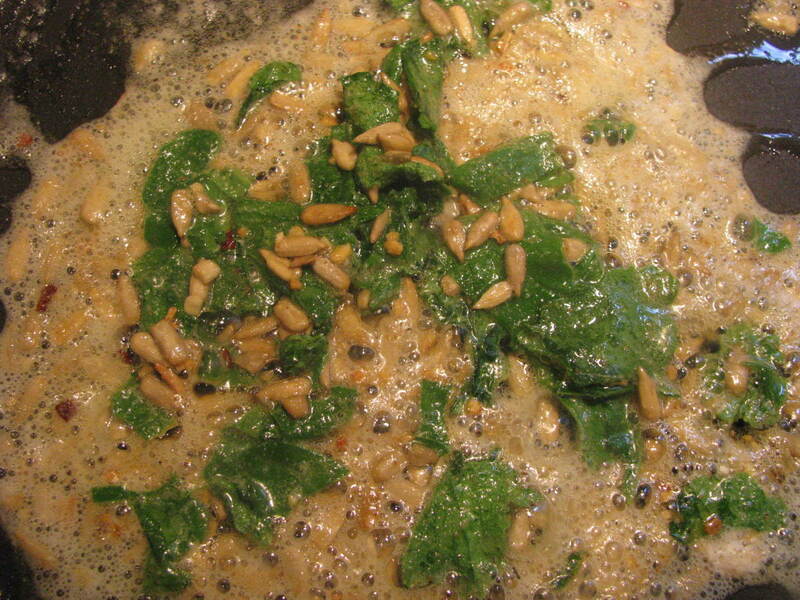 This summer I should try your sauteed greens with sunflower seeds recipe; that sounds good, too. Voted up, useful, and shared. epbooks, you'd be surprised: cooked just right, radish greens are delicious! Thanks for reading! I have to admit, I've never been a fan of radish so I'm not familiar with Radish greens, however, after reading this, I will keep an open mind to it-if nothing else but for the health benefits alone. Voted up and useful! Interesting...I will plant and taste the radish leaves. 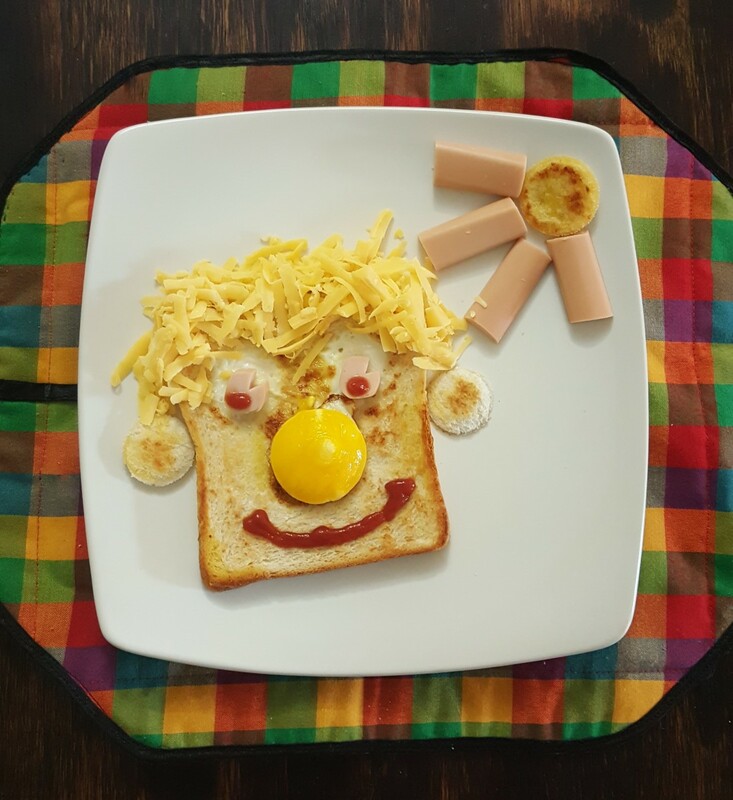 Thank you mommy for share your recipe! Simone, oh, you need to try a radish! They are delicious, crisp, and sometimes spicy. Thank you very much for reading and commenting! I don't think I've ever had a radish before, let alone radish greens. I'd love to try this! teaches12345, I'm glad you like the salad idea! It's very refreshing for a hot summer day. :) Thanks for reading and commenting! 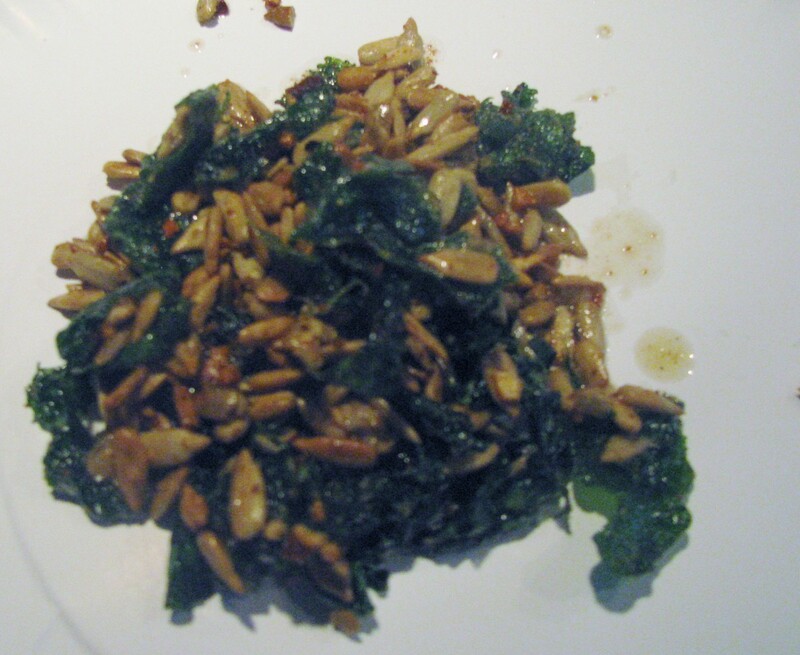 Tonipet, the recipe with the sunflower seeds is delicious; let me know what you think if you try it! Thanks very much for reading and commenting! Voted upu and useful. I too like radishes but never thought of eating the leaves! 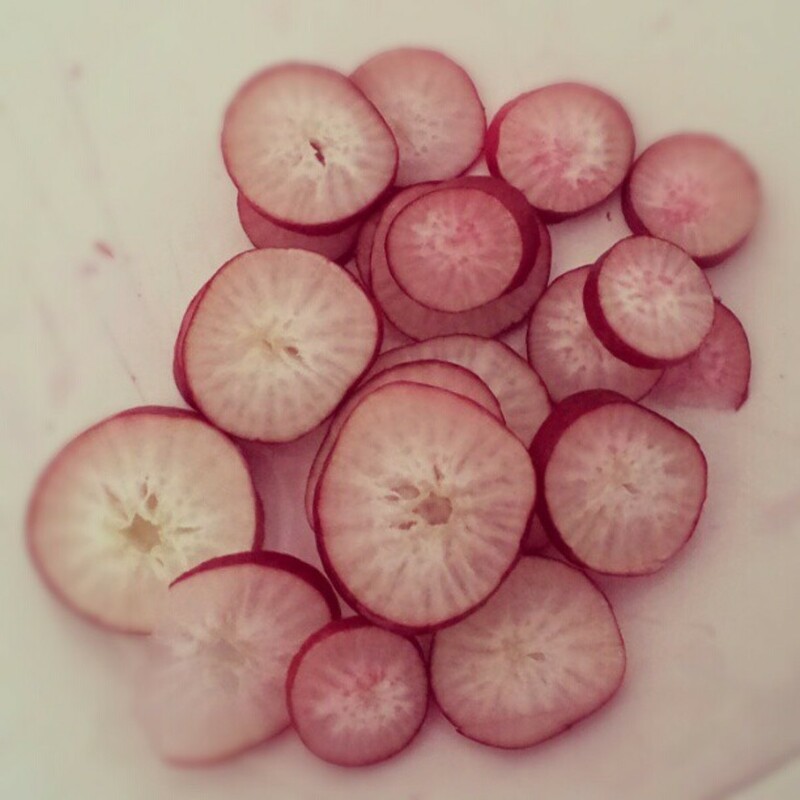 I was amazed to see how healthy radishes are...my father-in-law eats them likek apples. I guess that's why at 89 he is a vibrant man! 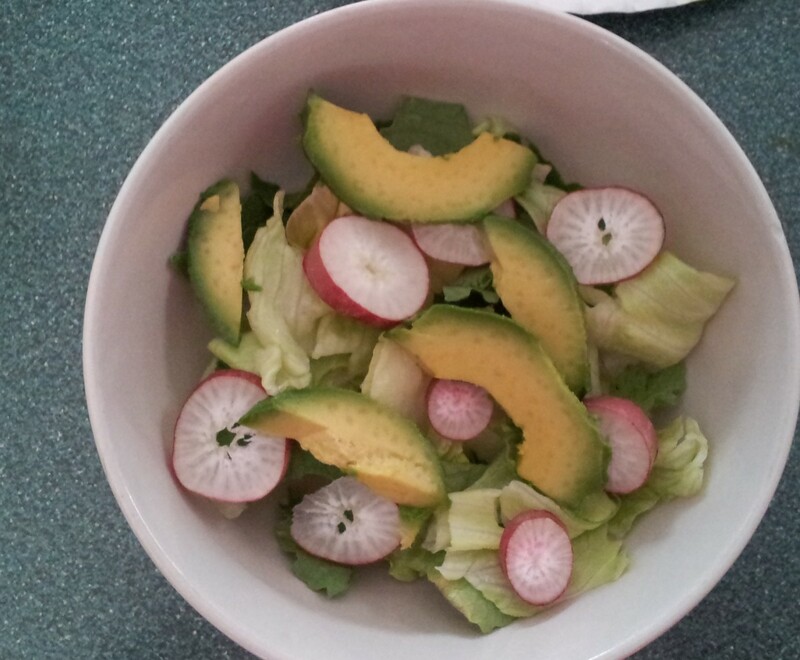 I love the avocado and radish salad idea. This would mix my favorite flavors for an enjoyable meal.. Didn't know the leaves were edible and how healthy it was to eat a radish. I'd also never thought of eating radish greens! I'll have to try sautéing them. Thanks for the idea! Hadn't thought about eating radish greens before. I like other greens - so will have to try.